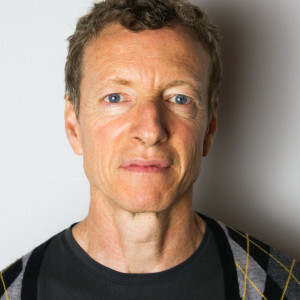 Andrew Robertson is a senior research scientist at the International Research Institute for Climate and Society, where he also heads the climate group. Much of his research relates to improving climate forecasts with lead times between two weeks to two months, which scientists refer to as the subseasonal-to-seasonal (S2S) timescale. Decision makers in sectors such as agriculture, water management, health and disaster risk reduction can potentially use S2S forecasts to improve efficiency in their operations, and safeguard life and property. For more background on Robertson’s research and its applications, read this Q&A about his work on forecasts at multiple timescales. Robertson co-chairs the S2S Prediction Project Steering Group, which is the first collaboration of the World Climate Research Program (WCRP) and the World Weather Research Program (WWRP), both of which are sponsored by the World Meteorological Organization (WMO). Elisabeth Gawthrop sat down with Robertson to learn more about the new data portal that the S2S Prediction Project launched in May. Can you describe the collaboration between WCRP and WWRP? What brought these two groups together? The tagline of the project is “bridging the gap between weather and climate.” Traditionally these communities have been pretty separate, but lately the World Weather Research Program has been moving toward longer timescales. It has recognized that in certain situations we can have forecast skill at timescales beyond two weeks. Meanwhile, at the World Climate Research Program, interest in daily weather extremes related to climate change has brought its focus down to the weather scale. So it’s an opportune time for these groups to come together. Briefly, what is the S2S project? Who is involved? The main goal of S2S is to improve forecast skill and understanding of the sub-seasonal to seasonal timescale, and to promote its uptake by operational centers and use by the applications communities. We hope to improve prediction of high-impact weather events between 15 days and a season ahead, as well as the climate services that can use these forecasts . A primary motivation is to contribute to the Global Framework for Climate Services (GFCS) and help society adapt to climate change by being able to forecast floods, droughts, heat and cold waves, and tropical cyclones with better accuracy and longer lead times. There are a few coordinating scientists at WMO, but most of those involved are researchers from universities and scientists from operational forecasting centers around the world. 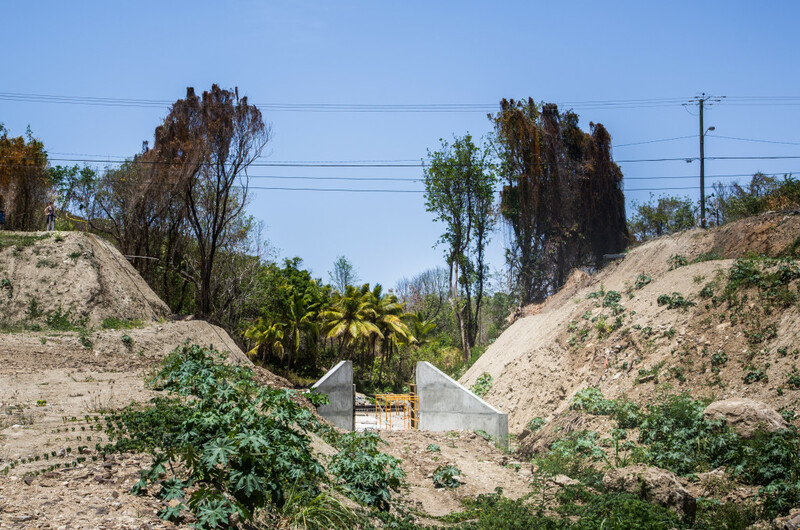 Does the project provide funding? The project doesn’t directly fund people, but it connects scientists who are doing related work. There’s an expectation for the S2S project to link up with the various WMO working groups. It gives S2S a seat at the table when these groups get together, and thus prioritizes research at the S2S timescale. For example, there’s WMO’s working group on numerical experimentation (WGNE); they’re the people who work on the models. The project should allow us to connect with this group to work on model improvement at the S2S timescale. There are various common challenges to forecasting, such as initialization of the models and the way the ensembles are generated. These technical elements may be particularly important for the S2S timescale. If coordinating groups such as S2S didn’t exist, research would likely be much more piecemeal. They improve access to data, efficiency of work, prevent duplication and free up and enable funding sources. 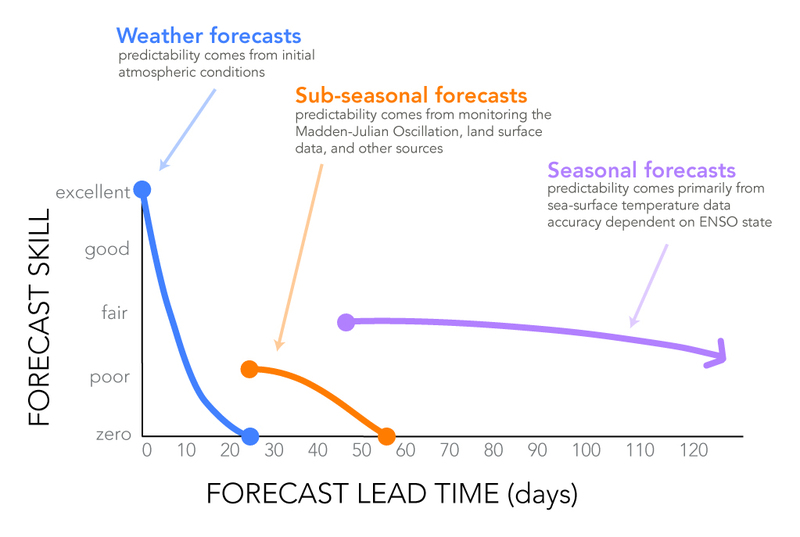 This graphic is a qualitative estimate of forecast skill based on the lead time of the forecast’s issuing. In addition to the differences in the sources of predictability noted in the graphic, there are also differences in the nature of the forecasts. Weather (short-term) forecasts tend to be deterministic (e.g. the temperature will be 85ºF today). As forecasts move into longer-range timescales, the methods and data that go into the forecasts change, and so the nature of the forecast also changes. A greater level of uncertainty must be factored in to sub-seasonal and seasonal forecasts. So, instead of predicting specific weather events, the longer-range forecasts typically predict climate using probabilities, like the chances of a season being hotter, cooler, drier or wetter than average. Based on feedback from climate information users, researchers are also developing forecasts that predict other parameters, like the frequency of rainfall events over a season. Therefore, saying that a sub-seasonal or seasonal forecast has good skill does not mean it can accurately predict daily weather weeks or months ahead of time, but rather that it does a good job of predicting if the climate over the course of the season is going to deviate much from average. Infographic adapted by Elisabeth Gawthrop from figure by Tony Barnston. What is the database that’s just been released? One of the project’s main deliverables is a public database of sub-seasonal forecasts from about eleven forecasting centers around the world. It is located at the European Centre for Medium-Range Weather Forecasts and will soon be available from the Chinese Meteorological Agency too. This will be a huge resource to the climate and applications communities that will allow researchers to analyze the model output, assess when and where there is skill, better understand the underlying processes and model weaknesses, combine models together and eventually build applications that can help in decision support. We hope it will generate a lot of community interest. It’s a research database, so the forecasts become available 3 weeks behind real time, but re-forecasts over past years are also included which is very important for testing the forecasts. Four models are already available (see s2sprediction.net) with more to follow soon. What other activities is the Steering Group organizing? Besides coordinating the database, we have set up five sub-projects to stimulate community research on S2S topics including monsoons, the MJO, extreme events, teleconnections, forecast verification and African applications. Researchers can find details on the project web page and we encourage them to get involved. We are also organizing regular workshops. We just had one on S2S predictability of monsoons, held at the Korean Meteorological Agency, which hosts the S2S Project office. We are planning to develop some case studies of extreme events, through which we’ll focus on a high impact weather event and examine whether or not it had been predicted and how a forecast of that could have been used by decision makers. The extremes sub-project is looking at the cold wave in Europe in February 2013 to see how it was handled in the models. We’re also coordinating with the International Federation of Red Cross and Red Crescent Societies in real time to be aware of important events for the humanitarian aid community. How do you anticipate working with end-users to apply the improved S2S forecasts? S2S’s contribution to the Global Framework for Climate Services is primarily through the Research, Modeling and Prediction component of GFCS. We are working with WWRP’s Societal and Economic Research Applications (SERA) working group, with WMO’s Commissions, and with IRI to develop end-user applications. I think now that the data base is open to the public, this aspect of S2S will really take off and I’m excited about the possibilities. What do you, and through you IRI more generally, bring to the S2S project? That’s an excellent question. I think IRI has a huge amount to offer S2S from our 20 years of experience with developing seasonal forecasts for use in real-world decision making in developing countries and in different sectoral contexts. For example, IRI has stressed a participatory approach, together with decision makers and key intermediaries, to developing decision-relevant information. The verification of forecasts in the user context is something very important to the uptake of forecasts, as is identifying the best entry points for forecasts. The latter is often an intermediary such as a national meteorological service, an agricultural extension service, or an agency like the IFRC. For example IRI has worked a lot in Africa, Asia and Latin America with CCAFS, which is the Climate Change, Agriculture and Food Security program of the CGAIR Consortium of International Agricultural Research Centers. Having these connections with the agricultural community can be of great value to S2S. Where is there the most opportunity for improving S2S forecasts? There are two main categories of opportunities for improvement. One is identifying areas where the skill of the forecasts could be improved, and the other is the delivery of forecasts that have value in given societal context. One place of low-hanging fruit that fits both is India and its monsoon. Seasonal forecasting is generally difficult there, but there is a strong intraseasonal oscillation “ISO” within the monsoon season which is a major cause of monsoon breaks and active phases, which is potentially predictable. At IRI we tend to focus on the seasonal forecast, but the skill over India is often terrible. But irrigation scheduling decisions may benefit from a weather forecast, while planning fertilizer application could use a forecast for the second fortnight of the month. This is what is often referred to as “seamless forecasting” where we make use of a set of forecasts for different time ranges. I think that’s where this project could have the biggest impact, because monsoon forecasts for 15-30 days out may be more skillful than the seasonal ones, they could add to the information available. Forecasts at this timescale also allow for frequent updating. So there’s a lot of scope for forecasts in the S2S range.